Valentine Bagnoud joined LALIVE as an associate in 2018. Her main areas of practice are domestic and international litigation, in particular white collar crime and mutual assistance in criminal matters. 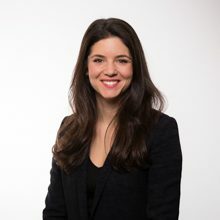 Before joining LALIVE, Valentine Bagnoud worked as a consultant for Paladin PBC in New York (2017), a platform focused on pro bono legal work and as an associate with RVMH Avocats in Geneva (2014-2016). She completed internships with Ming Halpérin Burger Inaudi in Geneva and at the Geneva Court of First Instance (2011-2013) before being admitted to the Geneva bar in 2013. Valentine Bagnoud is a member of the Geneva Bar Association and of the Swiss Bar Association (SAV/FSA). Valentine Bagnoud graduated in 2010 from the University of Geneva, including an exchange semester at the University of Zurich, and completed training courses in communication at New York University (2016). In 2012, she won both the first prize of the Michel Nançoz trial advocacy competition organized by the Geneva Bar Association and the second prize of the Prix Paris-Montréal de la Francophonie eloquence competition organized by the Montreal Bar Association.